How much can you learn in these one day clinics? Plenty! 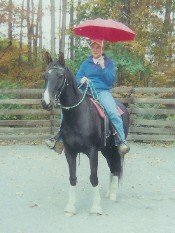 You'll see how to gain more respect and obedience from your horse both on the ground and in the saddle. And if you are one of the many riders battling fear, you'll discover safe ways to control the fear instead of it controlling you. If there is a topic you and your friends would like to see, for example trailer loading or trail obstacles, new or private clinics can be arranged to suit your schedule. Spooking on the trail is very common and can take the fun out of your ride. Fortunately, there is plenty we can do to help your horse become brave and reliable on trails. You'll see the "relax cue" that makes your horse relax instantly when he gets scared. This one has saved me many a time from a blowup! You'll get to learn the effortless trick that keeps you in the saddle during a spook - even a beginner can do it! Plus, I'll show you ways to get your horse to calmly pass scary obstacles on the trail. Please see below to register. Don't Let Fear Steal Your Fun! Do you have "mixed feelings" about riding or spending time with your horse? Have you had a close call or injury that made the thought of riding put a knot in your stomach? Do you find yourself making excuses NOT to ride? Then fear may be spoiling your fun with your horse. You'll learn many ways to control these feelings instead of the fear controlling you. 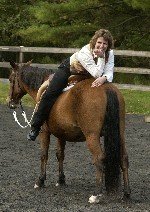 You'll see how to regain your confidence and enjoy your horse! In the past, Don't Let Fear Steal Your Fun clinics have been so successful without horses, we've decided to make this one auditors-only. You may apply what you learn at this clinic at home with your horse, working privately with Kathy or best of all, at a week long Apprenticeship. No one will be pressured into doing anything they don't feel comfortable doing. Each person will progress at their own rate and build confidence. Arrival Times - You may bring your horse on Friday between 4 PM and 7PM or Saturday morning in time to be ready by 9AM. There is plenty of space for trailer parking. After the clinic, horses are welcome to leave either that evening or the next morning. What to Bring - A lawn chair and notebook. Lunch - There will be a lunch break and you may bring your own lunch or sample one of the nearby restaurants. Extra Fees - Nope, there aren't any. Stalls are free as long as you clean up before leaving and provide your own feed, buckets and bedding, or you may purchase shavings here. Or email khuggins@sunlink.net with questions or to set up a time to call 570-458-6490 and speak to Kathy.